In addition to the series "PRODUCT VISUALIZATION IN BLENDER,"
to www.blenderartist.org or to the Member's Gallery of this site, or Contact Us to show where your work is available on the internet. How good is Blender as an arch viz tool? Where can you locate competent studio or a freelancer for commission? You might find the answers in the arts and comments made by the following artists, some of the many that are scheduled to be featured in this series. My name is Ján Morek. I am a hard-working, stubborn, and passionate freelance 3D artist, always striving for excellence in satisfying my client's needs. I focus on doing realistic 3D visualizations in Blender, with post-production in Photoshop afterward. I have more than five years of experience in working with these programs. And due to my educational background, I can offer strong architectural as well as artistic input. Not only do I know construction techniques, building codes, and laws--which can be beneficial for the client and saves lots of time and money--I also approach each project to be an artistic piece. 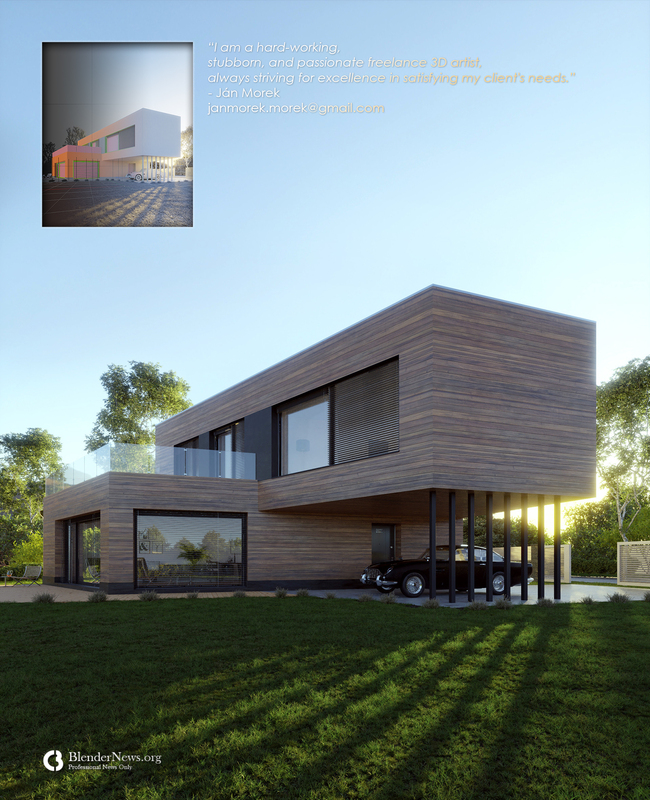 I am interested in architectural visualization projects of all kinds all over the Europe. I can create for you still images, 360° images, or animations. About "House by Lavarch architects:"
The first shot from my new project - house designed by Lavarch architects. My friend who works as an architect asked me if I can create a visualization for one of his projects. He gave me freedom with the setting of camera and lighting. I wanted to create interesting evening mood, that is why I chose this angle and position of HDRI map.